The Learn By Doing Lab (LBDL) at Cal Poly, San Luis Obispo is an on-campus laboratory where 5th through 8th grade students are taught by undergraduates who may be planning a careers in teaching. The two populations - elementary students and undergraduates - are equally important in the process. Since 2008, the lab has seen over 4000 elementary and junior high students and over 100 undergrads have participated. In most outreach assessment the number of individuals participating is an important metric, but this last Spring we experimented with a more in depth measure of effectiveness. As in any learning experience engagement in the process is an essential ingredient. 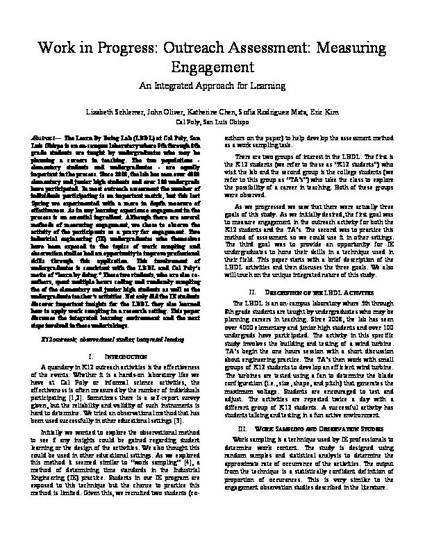 Although there are several methods of measuring engagement, we chose to observe the activity of the participants as a proxy for engagement. Two industrial engineering (IE) undergraduates who themselves have been exposed to the topics of work sampling and observation studies had an opportunity to improve professional skills through this application. This involvement of undergraduates is consistent with the LBDL and Cal Poly’s motto of “learn by doing.” These two students, who are also coauthors, spent multiple hours coding and randomly sampling the of the elementary and junior high students as well as the undergraduate teacher’s activities. Not only did the IE students discover important insights for the LDBL they also learned how to apply work sampling in a research setting. This paper discusses the integrated learning environment and the next steps involved in these undertakings.